How do I identify different ticks? 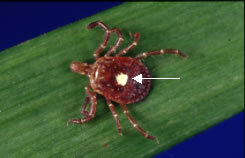 The common dog tick can range in size from very small, but clearly visible, to quite large. Then when they're engorged, they blow up like a big greyish/greenish blob (green or grey color tick). Two engorged dog ticks. The one on the bottom is on its back. 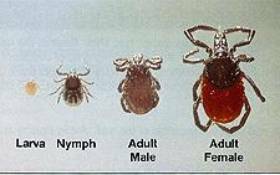 Shown below are the different stages of I. scapularis, (the Deer Tick), the tick that is primarily responsible for transmitting Lyme disease in the northern and north central United States. 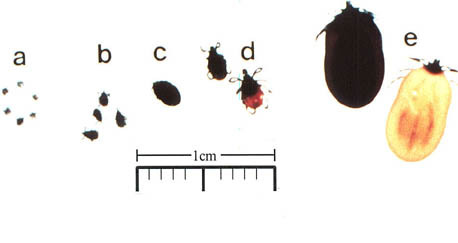 Section a shows larval ticks, which are < 1mm in diameter. 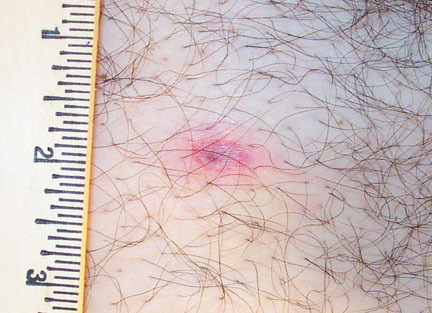 "b" shows unengorged nymps, which are only 1 to 2 mm in diameter. 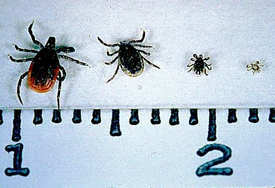 This is primarily responsible for transmission of Lyme Disease to humans during the late spring and early summer. Section c shows an engorged nymph. 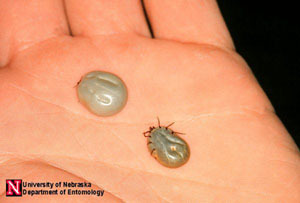 Section d shows unengorged adult male (black) and female (orange) ticks, and "e" shows engorged adult male and female ticks. Note that this is greatly enlarged to show detail. 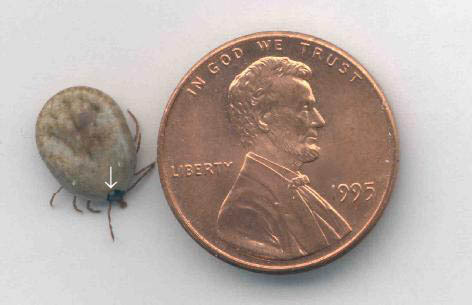 Here is a female deer tick, greatly enlarged, shown with a dime for scale. Here is a zoomed-in close-up view of the 4 stages of the Deer Tick. Finally, here it is in actual size - 1.4 centimeters. Can you even see the fourth one? It is the third one, the next-to-smallest one, that is primarily responsible for the transmission of Lyme disease to Humans in late Spring and early Summer. 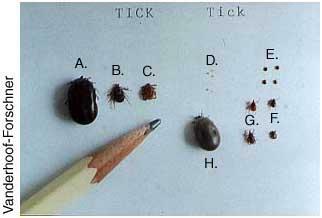 Here is another good picture to help differentiate between deer ticks and dog ticks. Also according to the RI Department of Health, there are two other species of ticks that carry Lyme disease: One is I. Pacificus, or the Western Black-Legged Tick which, and is VERY similar to I. Scapularis, the Black-Legged Tick (Deer Tick). The Western Black-Legged Tick is found primarily in the Pacific US and British Columbia. "The white dot on the scutum is evident and identifies this tick as a Lone Star tick, which can also carry Lyme disease. Also note the long mouth parts. In all engorged ticks the scutum does not expand and is a good place to start for identification." in the United States. The counties shown in black here account for 90% of all cases. Click the picture to see a more detailed view by county. 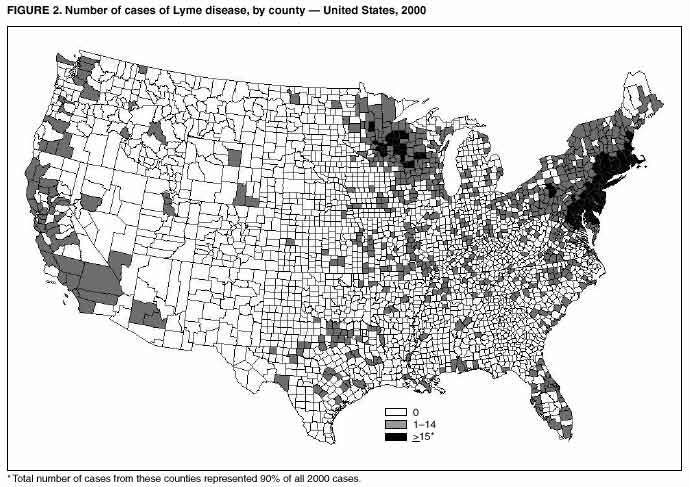 ...and here is a map showing how often Lyme Disease actually occurred in 2005 in the United States, County-by-County. From the Centers for Disease Control and Prevention. UPDATE: In an amazing coincidence, I was recently bitten by a tick and treated prophylactically with Doxycycline for Lyme Disease. I started this page a few years ago to help people quantify and understand the risks of Lyme Disease, and to identify ticks that had bitten their families. I had never had a tick really well attached to me or find one engorged. My wife has had ticks fairly well attached, but also never engorged, and always came out "cleanly" on removal. On the morning of November 7th, 2005 I noticed a little "sticking" sensation as I was tying my robe, like someone had left a price tag on the inside, though this wasn't a new robe. I readjusted the belt and tightened and I felt it again. So I opened my robe, and what did I see, but a damn tick embedded in my stomach, with a red circle around it. I thought: "You've GOT to be kidding me!" Now I know it takes some time for the "classic" bull's eye (Erythema migrans) rash to appear, but this just looked so inflamed and nasty (the picture really makes it look kind of washed out), and the tick was very small and engorged, so I call my doctor and she says "Come on over". I pay my $15 co-pay, and she writes a prescription for 2 tablets of Doxycycline, which go for about 8 cents each retail... except that there is a minimum charge at all pharmacies nowadys. At mine it's $7.99. So for $23 I get what I want, a couple of Doxycycline tablets. I take them. I develop a very bad headache. Later that day reading a little more about Doxycycline, that's a common side effect that should cause me to call my doctor. Well, I didn't and I was fine, and the bite healed, and now it's 6 months later and no Lyme Disease. Looking around on the web, I found a picture of a man with a similar looking case to mine: His had progressed a little farther than mine had. He had Lyme disease. If you can easily see the tick, there's nothing to worry about. If you can't see a tick, be very, very afraid. Copyright 2000 - 2011 by OES.org. All rights reserved.